Last hours of Black Friday Preview Weekend at Payless ShoeSource stores in the U.S. are here + extra savings with printable coupon. Take an extra 30% off your entire purchase, valid for Payless Rewards members. If you are not a member you do not have to be sad. 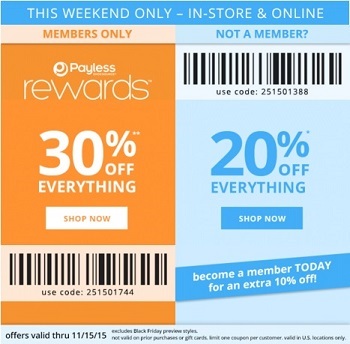 Payless ShoeSource also prepared a special offer for not members. They can take 20% off entire purchase. Source of the information is Payless ShoeSource. Offer expires today 11/15/2015. More details available at stores.